The Star Wars story-cycle is one of the most popular of our modern myths, but also one of the most garbled. 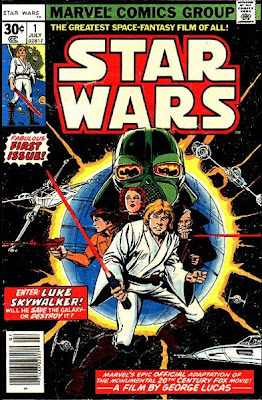 For the original trilogy, George Lucas consciously drew upon mythic and religious elements (ransacking every myth, fairy tale, scifi story and comic book he could get his hands on, especially Jack Kirby's New Gods), but not always coherently. Six films were made in all (Lucas has recently promised that more are on the way), but only the first (Chapter IV: A New Hope, 1977) and the last (Chapter III: Revenge of the Sith, 2005) hit the symbolic bases in the way that something like the Star Trek: the Next Generation films do. The films in-between are mostly concerned with high adventure and dazzling special effects. Even so, Lucas has accomplished something unique with the Star Wars films in that they truly form a cycle. The reverse chronology motif of ritual drama (meaning the drama is meant to reverse an unhappy historical event, often using reversal of time in the narrative) is used in a way to see the story as an endless loop, similar to the cycles of creation and destruction in Hindu theology. The last film in order of release ends on a down note, in which the hero of the past three films is transformed into the personification of evil. In order to experience the kind of redemption that ritual drama provides, you need to return to the first film, which is set after the last film chronologically. By watching the films in order by release, you are then returned -- by emotional necessity --back to the beginning. And by emphasizing the chapter assignation in the titles, viewers are now perpetually confused by what the ‘first film’ actually is. In the first-released Star Wars, we meet a Horus/Jesus analog (Luke Skywalker), an Osiris/Jesus who becomes a Set/Satan (Darth Vader), an Isis/Hathor/Mary amalgam in Princess Leia (who has Hthor’s warrior spirit), an Osiris/John the Baptist (Obi-Wan Kenobi), two Thoths in the droids C3PO and R2D2 (note similarity of the word ‘Droids’ to ‘Druids’) and an Anubis, split into the figures of Han Solo and Chewbacca (as Anubis the canine figure). Yet Han Solo also becomes a type of Osiris in the Empire Strikes Back in his symbolic killing by Boba Fet (Boba Set?). Han also connects to Anubis vis a vis his Christian adaptation, St. Christopher, the dog-headed Christ-bearer. In the mythology, Christopher carries the Infant Jesus across a dangerous river on the orders of a hermit (which is exactly what Obi-Wan is, of course). The identification of the Milky Way with the Nile River is worth remembering in this context. Along these lines, the first half of Return of the Jedi plays somewhat like an adaptation of the Mysteries of Isis and Osiris, when Leia and the others recover Han from Jabba the Hut and ‘resurrect’ him. The Contendings of Horus and Set is also mirrored in the clash of wills between Luke Skywalker and the desert-dwelling Jabba the Hut who has Solo encased in a Osirian carbonite coffin. How much of this is intentional and how much of it down to the fact that these conflicts have been used from everyone from the Bible writers to the authors of the various Arthurian Romances to Lucas’ most obvious touchstone Dune, is impossible to discern. Lucas himself probably couldn’t tell you. Star Wars introduces us to Luke Skywalker, a young farmer boy on the desert planet of Tatooine. Luke dreams of adventure and is filled with yearnings for his long-lost father, a legendary Jedi Knight whom Luke never knew. Adventure then finds him in the form of two robots or (“droids”), C3PO and R2D2, whom his uncle buys from the Jawas, a nomadic tribe of desert-dwelling merchants. While tinkering with R2D2, Luke triggers a holographic message intended for Obi Wan Kenobi from Princess Leia, who seeks his Kenobi’s help. 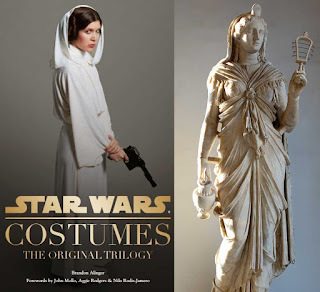 It's worth noting that in the message, Leia (meaning ‘ruler’ in Assyrian) is dressed to resemble the Roman depiction of Isis, replete with gown and veil. Luke knows of a Ben Kenobi, an old hermit who lives in the mountains nearby. What Luke does not know is that Kenobi has been standing guard as an unseen protector since Luke’s birth. Luke meets Obi-Wan after a near fatal encounter with a Tusken Raider, the Bedouin-like “sand people.” Luke shows Obi-Wan the message from Princess Leia, prompting Obi-Wan to reveal his true identity to Luke. Leia has included the schematics to the Death Star (an obvious Lunar stand-in) and asks Obi-Wan to deliver them to the rebels. The two then travel to the port city of Mos Eisley to find a ship to take them to Leia’s home planet, Alderaan. They meet Han Solo, the captain of the Millennium Falcon, in a bar and Obi-Wan offers Solo 17,000 credits to take he and Luke to Alderaan. The Falcon symbolism is self-explanatory, but the 17 requires a bit deeper understanding of the symbols. En route to Alderaan, Obi-Wan trains Luke in the ways of the Force while Solo scoffs at the old Jedi faith (as do other characters in the film). As the Millennium Falcon enters the Alderaan system they find only planetary debris. The fearsome Death Star, which had destroyed the planet, then appears in the distance. The Falcon is pulled aboard the Death Star via a tractor beam, and the men and the droids search for the princess. They find her but their escape is delayed as Obi-Wan fights with his former pupil, Darth Vader (played by David Prowse, with voiceover by James Earl Jones). As Luke and his friends try to escape the Death Star, Obi-Wan engages Darth Vader in combat to divert attention away from them. As Obi-Wan and Vader fight, the former warns the later of the futility of his cause. Obi-Wan is on the threshold of his apotheosis, and is about to become one with the Force. When he sees his companions escape with Princess Leia, he becomes discorporeal. Vader slices only through his empty cloak. Luke doesn’t understand and believes Obi-Wan has been struck down. The Millennium Falcon escapes and reaches the rebel base and the Death Star schematics are delivered. Luke joins the rebels, and they then attack the Death Star. The divine voice of Obi-Wan guides Luke as he completes his mission and the Death Star is destroyed. The conflict told here mirrors the Contendings of Horus and Set (and its endless clones), with Luke and Darth Vader battling using opposite sides of the Force, and the Emperor embodying the usurpation of rightful rule. But there are other important subtexts to the story (the secret to the film’s success is how many borrowed memes it packs into a very simple story). Again, the dissolved Jedi Knights clearly recall the dissolved Knights Templar, and Obi-Wan is very much a John the Baptist figure. Wan is pronounced the same as “Juan”, the Spanish variant of John (an obvious nod to Don Juan of the Carlos Castaneda novels). Darth Vader’s role in Star Wars is not generally understood. He is not a political figure- he is a religious one. He is essentially the pope of the Sith Empire. He acts as the inquisitor aboard the Death Star, not as its military commander. He is clearly doing the Emperor’s bidding, and leaves ordinary military protocol up to the Death Star’s commander, Grand Moff Tarkin (played by Peter Cushing). His faith is not held in high regard by the military men, and is ridiculed by one of Tarkin’s generals. Just as plot points from the original trilogy come from Kirby's New Gods (which was making waves at the time Lucas began working on Star Wars) Darth Vader is essentially a doppelganger of Stan Lee and Jack Kirby’s archvillain, Doctor Doom. The mix of mysticism and science, the body armor, the fascism- it’s all taken lock, stock and barrel from old Fantastic Four comics (Luke, Leia, Han and Chewbacca form their own foursome in this regard). As we see in later films, Vader is a broken and fragile man, kept alive only through the use of his armor. He can’t even breathe on his own. He personifies religion in service to the state; a dead, useless thing that can only bring misery and death. The “red” and gold” Rebel space-fighter squadrons give away the Solar-Lunar struggle being played out here.